Leisure World of Maryland is 2018's Best Value Community! 55places.com’s 25 Best Value Active Adult Communities of 2018 list is out and Leisure World® of Maryland rose above the rest to be named the No.1 value community in the country. 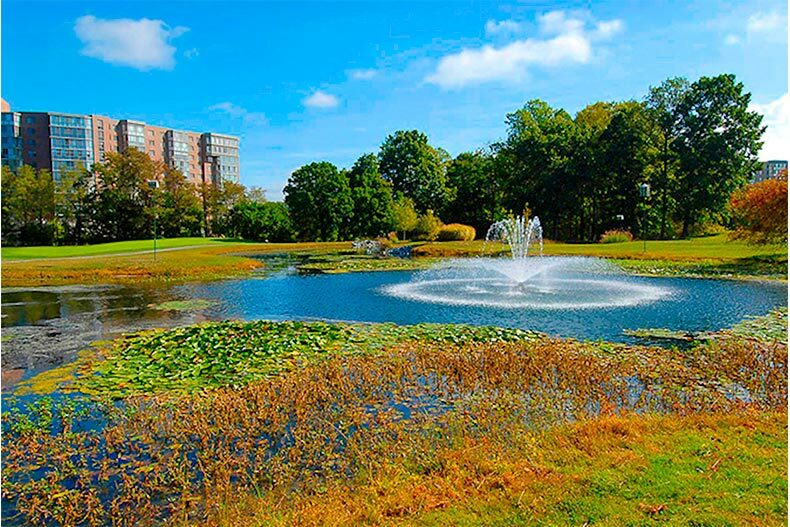 There are so many reasons as to why it was chosen, so let’s take a closer look to determine why this gated 55+ community in Silver Spring, Maryland gives its residents the most value for their money. The original homes in Leisure World® were constructed in 1964 but quite a few things have changed and been added since then. Nowadays, over 9,000 residents call it home across more than 5,600 residences. And there are all kinds of residences to choose from. The community offers one-, two-, and three-bedroom condos ranging from under $100K into the high $300s. You’ll find all sorts of unit options, including balconies, walk-in closets, flex rooms, and storage. Various attached homes can be found throughout the community as well. They range in size from 650 to 1,450 square feet with one to three bedrooms, one to two-and-a-half bathrooms, and a garage or parking spot. Some of them also offer a second floor. The single-family patio homes are the most recent addition. They range in size from 870 to 1,200 square feet in size. These residences offer two-to-three bedrooms, one-to-two bathrooms, patio space, and an attached two-car garage. 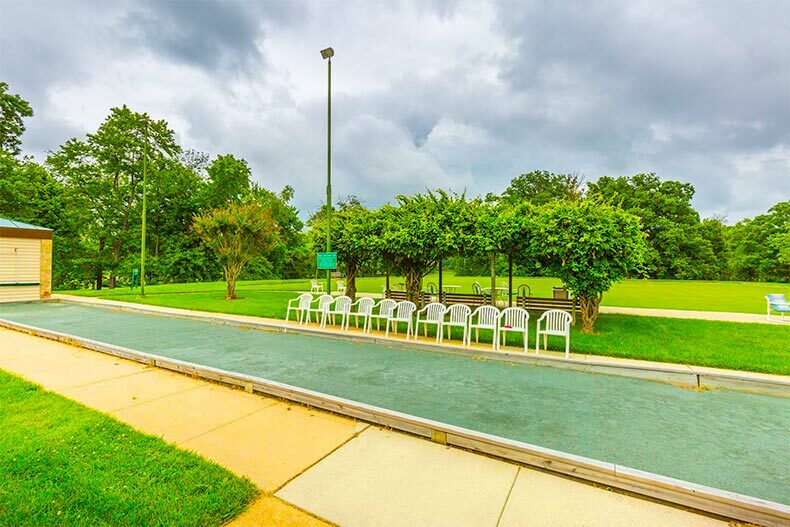 Bocce and shuffleboard courts are just two of the ways to have fun in Leisure World of Maryland. Inside Clubhouse I is where you’ll find the library, woodworking shop, ballroom and dance floor, classrooms, and three different restaurants. Outside, you’ll find the outdoor pool and patio as well as bocce and shuffleboard courts. Over at Clubhouse II, you’ll be able to get a good workout in the fitness center or indoor pool as well as relax in the movie theater or auditorium. Crafters will enjoy spending their days in the ceramics and lapidary studios. Outside is where you’ll find the tennis courts. There are also over 40 miles of walking trails and tons of green spaces in the community, meaning that whether you want to spend time indoors or outside, that time will be spent meaningfully. As you might expect, the community also has its own golf course. The 18-hole Leisure World Golf Course also includes a driving range and putting green as well as lockers, golf carts, and a pro shop. The nice thing for residents is that membership isn’t required so those who don’t want to pay extra for it don’t have to. Something that really sets Leisure World® of Maryland apart from other 55+ communities in the region are the services they offer to residents. Right there in the community, you’ll find a post office, a Bank of America branch, a pharmacy, medical facilities, and two houses of worship. Speaking of where you can go from Leisure World®, access to nearby Washington, D.C. is easy. The community is 10 minutes from Rockville Metro Station where you can pick up the Red Line right into the city. Metrobus also makes a stop at Leisure World® if you’d rather not drive. The community is also a 40-minute drive to Baltimore. If you’d rather stay close to home, the community offers its own shuttle bus to transport residents to the area’s shopping and entertainment. Downtown Silver Spring is home to plenty of restaurants, theaters, cinemas, and art galleries. It is prime territory for historic sites and parks as well.